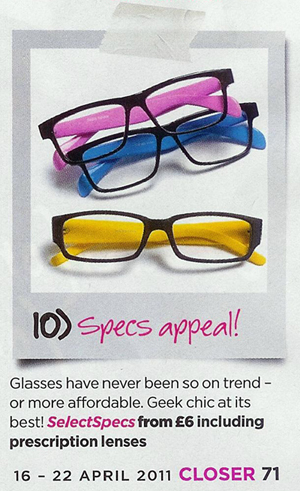 Our £6 Glasses are one of the 10 most desirable buys of the week in Closer magazine’s Wishlist this week! They are also the cheapest item on the list at only £6 and that’s including prescription lenses with UV protection, Scratch Resistant & Anti-Reflection coatings! Closer – 16th April 2011 edition is on sale now at all good newsagents (and some bad ones). I have had a pair of the £6 glasses for reader use. I have plus lens. Excellent quality & I am totally dependant on them now. Lovely & sharp.